I like swan photos and above you can see one that I a while ago. However, there was so much wrong with the original image that I tried to fix all the issues. The image is heavily edited and I think the result is interesting. The main problem was that I had difficulties to make adjustments, because either the swan looked great or the water, but not both together. It was difficult to make everything look great together and I started to think that I have to make individual changes. Lazy as I am, I made initial changes to the whole image and after that I started to use the adjustment brush in Lightroom to brighten the swan individually. I tried to make the water less apparent but the reflections more visible. I cropped the image until I was happy with the composition. At the end I was still not happy with the feather colours and decreased saturation. It’s experimental and lazy work but most of the time I don’t know what I am doing anyway. The swan is almost glowing now, maybe even a bit too much, and using the adjustment brush was messy, but I still think it looks interesting anyhow. 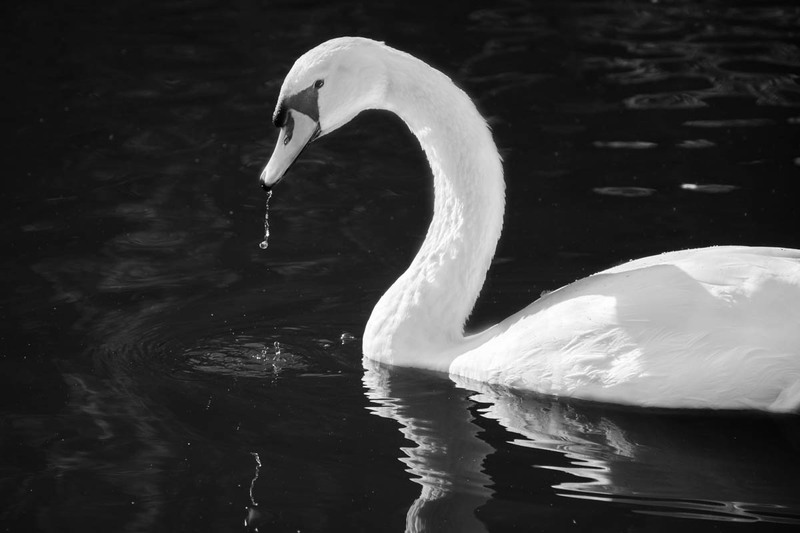 When you shoot a white swan on the water, use a spot meter setting on your camera. Take the light reading on the white swan. DON’T take the reading on the water or use a center-weighted or general light setting because it won’t work. You can bring up the lost detail from the shadows, but if you burn out the highlights, there’s nothing to restore. I shoot swans a lot. Try it. It works. I never changed the metering mode of my camera, this is a really interesting tip! I just started to learn about it after reading your comment. I am not sure how I could miss this all the time! Watching a nice explanation on YouTube, I think I start to understand what you mean. Do I get it right that I basically could achieve a darker water and a brighter swan by using spot metering as the camera will determinate exposure by the focus point? Also, I use one of the back buttons to focus, and to be able to change composition… will the metering change when I recompose or will it be stored? Can’t thank you enough for the tip Marilyn… I just tried spot metering at home with my cat, and with other subjects like a bottle cap and a red background. This is way too cool what you can do with spot metering!